Cinema, Mon Amour was selected in the Next Masters sections at the 58th edition of DOK Leipzig – the biggest documentary and animation event in Germany. Alexandru Belc's documentary will compete for a prize of 10,000 euro along with 12 other documentaries made by filmmakers at their first or second feature film. The project also won the Cat&Docs Award and the Croatian Radio Television HRT Award (each worth 2,000 euros) within the Docu Rough Cut Boutique workshop of the Sarajevo Film Festival. “Victor Purice definitely deserves a medal as a “Hero of Socialist Labour”. Witnessing the desperation, the vigour, the persistence with which he keeps fighting for his cinema brings tears to the eyes. 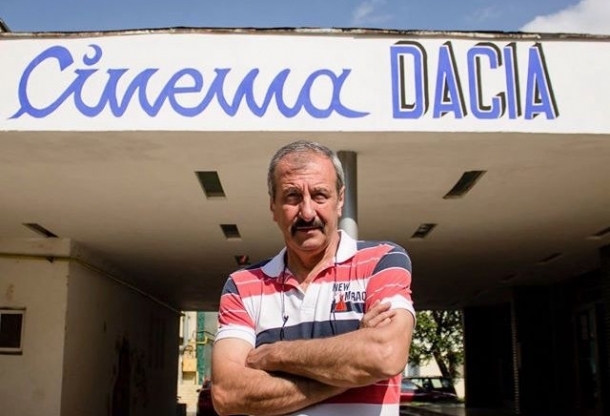 The “Dacia” Panorama Film Theatre, somewhere in the Romanian province, a concrete beauty with several hundred seats, a good-sized foyer and solid 35 mm projection equipment is on the brink of failure. It shares the fate of many Romanian cinemas; there are less than 30 left. The others were privatised, sold off, turned into amusement arcades or discotheques, even the film studio sold many of them. What nonsense – just as we are celebrating the new golden age of Romanian cinema in our part of the world! But Victor Purice and the small staff he has left will not be driven out of their dream cinema that easily. They live and cook among film reels, turn the foyer into a table tennis hall and watch a Hollywood blockbuster alone, if need be. All this is narrated affectionately and full of admiration for this modern Don Quixote who is fighting mismanagement, digital progress and a broken heating system. The price he pays is high. It’s to be feared that this story will not have a happy ending. Mission: Impossible”, writes Cornelia Klauß for DOK Leipzig. Cinema, Mon Amour is a Libra Film Production, co-produced by HBO Romania and Pink Productions (Czech Republic). The project was developed with the support of State Cinematography Fund Czech Republic and Creative Europe Programme – MEDIA of the European Union.